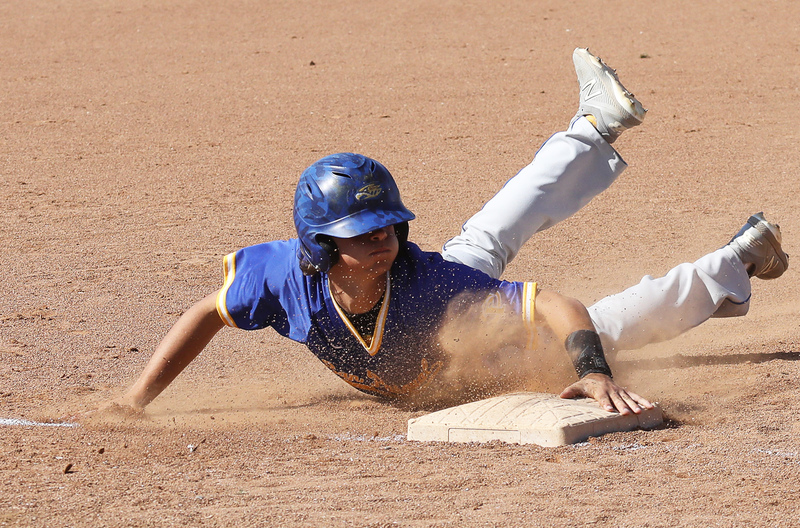 Last season, the San Pasqual High baseball team won 22 games, finished with a flourish and captured a CIF San Diego Section Division IV title under first-year coach Jake Blalock. Well don’t look now but the Golden Eagles have picked up right where they left off, flying high and giving every indication they are perfectly capable of hunting down some additional hardware in 2019. Thus far through 10 games of the current season, Blalock’s club has won eight, authored three shutouts and swung the bats in a most robust fashion. Moreover, the G. Eagles are in the midst of a seven-game winning streak that includes Monday’s dramatic come from behind victory over Oceanside in which SP rallied from a dicey deficit with an eight-run outburst in the sixth-inning. But it really isn’t at all surprising that SP has continued the mighty roll that it began last spring. After all, the club was returning a number of senior stalwarts like smooth shortstop Elijah Jackson, dependable outfielder/third baseman Josh Tuttle and clutch catcher Connor Oca. And on the mound, SP can showcase a pair of experienced and gifted lefthanders in Jansen Lublin and Connor Henson. And then there’s the weighty contribution from someone who wasn’t even on the roster last year. Newcomer Jason Hall is swinging the stick with a vengeance and making everyone forget that he’s only a freshman. When you put all those elements together and couple them with the invaluable guidance and instruction that Blalock and his coaching staff provides, the G. Eagles are a formidable group to say the least. There’s also no sense of complacency as SP’s hunger to achieve and win ball games remains undiminished and strong. 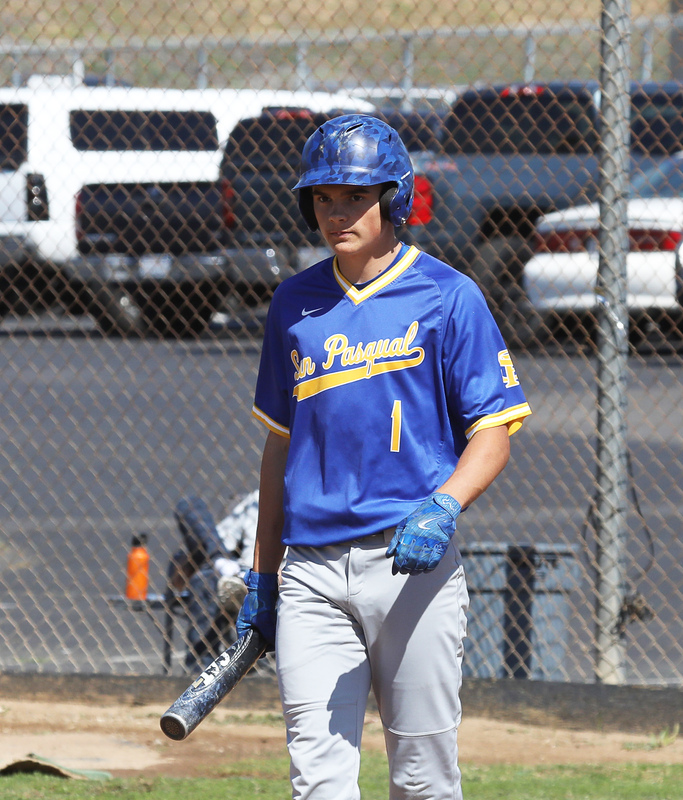 Versatile Josh Tuttle will be counted upon to provide a potent bat for San Pasqual. Just a brief look at the numbers suggests the firepower that Blalock has at his disposal. The offensive ringleader is the athletic Jackson who leads the way in average (.433), runs scored (11), walks (7) and SLG (.633). Meanwhile, the 6-foot-1 Tuttle is hitting at a .355 clip while being the pacesetter in doubles (6). The diminutive Oca never ceases to amaze with his production (.371 avg.) while Hall has some impressive across-the-board stats (.406 avg., a club-best 10 ribbies and 5 doubles.) The notable balance that this lineup presents is perhaps best reflected by the fact that Jackson, Oca and Hall have each rapped out 13 hits. And while SP’s offense has certainly made a mark, so has the pitching thanks largely to Lublin and Henson. The stout Lublin has grown into a highly-polished performer with a nice repertoire of offerings. The 5-11 senior possesses pop with his fastball and deception with his off-speed stuff. Unbeaten in three decisions including a masterful no-hitter over neighbor Classical Academy, this lefty carries with him a microscopic 1.31 ERA, having fanned 27 batters in 26.2 innings of work. Not to be outdone, Henson has proven to be the perfect complement to his fellow southpaw Lublin, hurling two complete games, spinning a shutout and pitching to a barely detectable 1.05 ERA. Indeed, with so many assets working in unison, the G. Eagles figure to stay airborne for quite awhile while they chase after a coveted Valley (League) title. And maybe even long enough to bring home another CIF crown. As an Alumni and former Lefty on the Eagle pitching staff in ’80 & ’81…. Cudos to all the Eagle players and especially the south-paws!! Come watch a game, please let us parents know that you an alumni!